We are back with another edition of Bag of Steps. This time we look at every turning trick designed to make us go “whoa” and typically reserved for the grand finale, such as in the coda from a Pas de Deux . Turns include female and male pirouettes and their offshoots. For the ballerina they are the signature bravura step, the ability to turn in 32 fouettées being her ultimate technical benchmark. For the danseur they are powerful wizardry tools, especially those multiple turns generated from a single impulse. Spin. A complete turn of the body on one foot. The supporting foot can be either on pointe or demi-pointe, with the working leg positioned sur le cou-de-pied, in arabesque, à la seconde, in attitude, etc. Legs give the impulse from a deep plié in preparatory position, arms control the turning speed and the head is the last part of the body to turn away from an imaginary “spotting” point and the first to hit the point again once the body completes the turn. Pirouette en dedans: a pirouette which turns inwards. The body turns towards the supporting leg, so if the dancer turns on the right foot, the dancer turns to the right. Pirouette en dehors: a pirouette which turns outwards. The body turns towards the raised leg, so if the dancer turns on the right foot, the dancer turns to the left. A dancer from Pennsylvania Ballet demonstrates a sequence of pirouettes en dehors. Grand Pirouette, Pirouette à la seconde (also, Tours à la seconde): Pirouette with one leg raised at 90 degrees. These are typically performed by men. Starting from fifth position with a grand battement into second position, legs lower into demi-plié to propel the turns. The arms start in second position and close in first, the right leg is raised into second with a swift movement for each turn en dehors. Mikhail Baryshnikov does a Grand Pirouette in this video of ABT’s Don Quixote. Whipped. In this step the raised foot undergoes a short “whipped” motion as it passes in front of, or behind, the supporting leg to the opposite direction. There are many types of fouettés. Here we will focus on those en tournant (ie. while turning). Grand Fouetté en Tournant (Italian Fouettés): Starting in arabesque, the dancer goes from a deep plié into a series of relevés en pointe or demi-pointe while swinging the back leg to the front. The arms move from first to fifth position. In a half turn, the body moves away from the lifted leg and ends in arabesque (or attitude, with the back to the audience). In a full turn, the leg is held devant until the body shifts through arabesque to start the movement again with the leg swept from the back. Yekaterina Kondaurova does a series of (full) Italian Fouettés in the Queen of the Dryads Variation of Mariinsky‘s Don Quixote. Move forward to the 1:21 mark. Fouetté Rond de Jambe en Tournant (Russian Fouetté turns): Starting on fourth, the dancer does a pirouette en dehors and then a demi-plié (fondu) while the working leg is thrown à la seconde. While the supporting leg relevés to pointe the dancer turns bending the working leg’s knee and passing the foot from behind to the front of the supporting leg. At the start of the series the arms open in second position to follow the leg and are brought into first while turning. Svetlana Zakharova throws a sequence of fouettés en tournant during the coda of Don Quixote’s Grand Pas de Deux. Fouetté Rond de Jambe en Tournant (Cecchetti Fouetté turns): Instead of extending the working leg à la seconde, the dancer throws the leg towards croisé devant en l’air, sweeps it à la seconde and turns while bringing the working foot from the side to the front of the supporting leg. Tamara Rojo executes Cecchetti style Fouetté turns in the same Don Quixote coda (adding a couple of multiple pirouettes). Move forward to 9:52 to watch. Piqué means Pricked or Struck. Piqué Tours en dedans (or Pirouette Piqué): the dancer steps en pointe onto a straight leg and turns while the opposite leg is brought into passé (so the turn is done towards the supporting leg). Polina Semionova does a series of piqué turns (en dedans) en manège, at the 1:34 mark, in Giselle’s first act variation. Piqué Tours en dehors (or “lame ducks”): the dancer steps en pointe onto a straight leg, half turns to place the opposite leg on the floor and picks up the original leg into passé. The turn is then done away from the supporting leg. Svetlana Zakharova does a series of “lame ducks” at the 1:47 mark in Swan Lake’s Odette’s Variation. A chain of “rolling balls”. In a diagonal, straight line or in circles, the dancer does a series of rapid turns on pointe or demi-pointe. When moving to the right, the turn is on the right leg and at the end of the turn the left foot is placed on the spot where the right foot began. At 1.21, Alina Cojocaru zips through a series of châinés (and some piqué turns sur le cou-de-pied) in this fragment of Ashton‘s Cinderella. Note. We recommend you also have a look at videos featuring such notable “human-spintops” as Maria Alexandrova, Gillian Murphy, Natalia Osipova, Tamara Rojo and Viengsay Valdés, not forgetting male dancers Carlos Acosta, Misha Baryshnikov, Ángel Corella and Leonid Sarafanov. This is the first post devoted to small jumps, the main components of what is known as petit allégro. Used in training they assist in the development of musicality, coordination, and quick footwork (stressing the use of the lower leg) while onstage, they are widely used in variations and/or character dances in full-length ballets, most prominently in Bournonville. A straight up jump from fifth, with both legs and arches extended. Starting from a demi-plié to gain impulse, the dancer springs into the air, being careful not to brush one calf against the other. In some schools, this may also be a travelling jump, ie. the dancer moves from its original departure point. Bolshoi’s Nelli Kobakhidze performs a series of sissonne soubresauts in act 2 of Giselle. Move forward to 6:27. If while performing a sissone soubresaut the dancer’s legs are bent in attitude, the jump becomes known as temps de l’ange. It literally means a “jumping, escaping movement”. The dancer starts in fifth position and jumps to finish in a demi-plié in second position or fourth position, with both feet traveling in equal distance from the original centre. A jump where the feet change positions. The dancer starts in fifth position and jumps straight up and down, getting impulse from a plié and changing feet in the air to land back in fifth, opposite foot in front. It is a type of changement where one calf beats against the other before the feet change position to land in fifth. Because of this it can also be referred to as changement battú (ie. battú=beaten). Here is a masterclass in allegro, featuring all the steps above described, although all of them – not just the Royales – are beaten, meaning that the calves touch before landing. Johan Kobborg as James in Bournonville‘s La Sylphide. Notice the échappés around 1.20 (with a beat) and royales everywhere. Stands for braiding (or interlacing). It is a straight up jump from fifth, in which the dancer crosses its legs rapidly while in the air by switching opposite fifth positions. Landing on both feet: entrechats deux, quatre, six, huit, dix. Landing on one foot: entrechats trois, cinq, sept, neuf. Royal Ballet’s Johan Kobborg does the famous series of entrechats-six in the coda of Giselle Act II. Move forward to the 5:07 mark. Means “Step of the cat”. The dancer starts in fifth position and the front leg is lifted through retiré as the other leg pushes off the floor and is also raised into a retiré. The first leg lands first, with the second leg following to close in fifth. The Cygnets (small swans) in Mariinsky’s production of Swan Lake doing a series of pas de chats in a diagonal around the 1.36 mark. There’s also a series of entrechats-quatre before. Mariinsky’s Maya Dumchenko does some Russian Pas de Chats at 0:17, while dancing the Paquita 4th Variation. A small jump which is mainly used to power a big one, or to connect another step. Starting from fifth position, the dancer does a demi-plié and springs slightly upwards. Front leg glides along the floor towards second position, the whole body traveling towards this extended leg, while the back leg glides onto fifth position, so the dancer is again in demi-plié, ready for the subsequent step. Glissades can be done in all directions (en avant = forward, en arrière = backwards, à la seconde, etc. ), with the feet changing accordingly when closing into the final plié. Assembler means “to put together” or “to assemble”. One starts from fifth position and plié. The back leg slides off to a 45 degree angle battement (beating) on the side, while the front leg (now turned supporting leg) pushes and extends off the floor. The working leg closes in front fifth position, with both legs coming to the ground at the same time. Done in this way, the assemblé is said to have been executed dessus (from the back to the front) but can also be done dessous (from the front to the back). This step does not travel, ie. the dancer remains in its original position. Paris Opera Ballet dancers Emmanuel Thibault, Nolwenn Daniel and Mélanie Hurel do assemblés around the 0:33 & 0:40 mark in this beautiful pas de trois from Paquita. Look out for glissades at 1.29 & 1:35, changements at 2:53 & 2:57, entrechats at 4:30 & pas de chats at 4:38 & 4.40. Brisé stands for “broken”. This step is like a “beaten and travelled” version of the assemblé. It can be done en avant and en arrière: en avant, the dancer starts from fifth, back leg brushing in effacé devant and supporting leg pushing from the floor to beat the other leg from behind and front, finishing in fifth position (demi-plié), body arched towards the front throughout. En arriére, all positions are reversed (now the working leg is thrown to effacé derriere), body arched towards the back throughout. Royal Ballet’s Alina Cojocaru (with Johan Kobborg) in a series of brisés in a diagonal, at around 4:52 in this Flower Festival in Genzano Pas de Deux. In this post we continue to look at some of the big jumps that have historically filled the vision of many choreographers and which continue to fill the eyes of an audience. Our focus is on a set of common jumps, which tend to occur in almost every classical variation rather than on the flashy jumps which we already covered in Part 1. Propelled from a deep plié in fifth position, the dancer jumps, making a complete turn in the air, switching feet and landing back in tight (closed) fifth position. ABT’s Daniil Simkin in a variation from The Sleeping Beauty, where he executes some tours en l’air around the 1.07 mark. A bravura type combination of tours en l’air, pirouettes and spins. A true feat of technical prowess. Legendary Mikhail Baryshnikov does poisson jumps in his diagonal of cabriolés during Albrecht‘s variation in act 2 of Giselle. Also called a développé grand jeté. The working leg passes through retiré and is thrown forward into a développé, so both legs end up extended forming a 180 degree angle. Paris Opera Ballet’s Aurélie Dupont does some saut de chats at the beginning of Gamzatti‘s variation in La Bayadère. As in a grand jeté the dancer starts by throwing the first leg into a grand battement but then pulls the second leg into passé and lands on the first leg, with the second joining in fifth or in an arabesque. Alternatively the dancer may throw the first leg as in a saut de chat (see above). 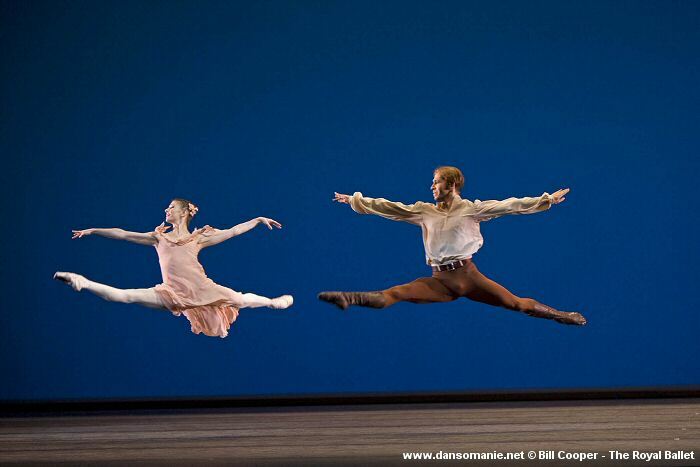 As this step was frequently used by Balanchine, it is also informally known as “Balanchine’s jump” (see the entrance of Stars and Stripes or Theme and Variations). This jump, from both feet onto one foot, looks like the action of crossing blades in a pair of scissors. The jump starts from fifth position and lands on the leg which the dancer jumped from, leaving the other leg extended in dégagé (pointed toe extended off the floor at 45 degrees, a la seconde or en arrière). This literally means “big open sissonne“. One jumps high from a deep plié in fifth position, landing on one foot in a pose such as attitude, arabesque a la seconde, etc. It can be performed en avant, de côté or en arrière. A video of this step is available here [link]. This is a compound step which starts with a sissonne ouverte de côté (see above), followed by a coupé and an assemblé. It can be done as part of a series, in which one travels in one or more directions. Mariinsky’s Vladimir Shklyarov does a whole series of sissonnes. Starting at 3:00, he does a Grand Sissonne de côté, assemblé, sissonne doublée and repeats (There are also some beautiful tours en l’air on 3:23 and a tour de force around 3:25). All dance steps stem naturally from the alignment and position of the body, so it is not that the dancer will stop in effacé devant, for some seconds, as they might do in class and then proceed with a particular step. That would turn a solo/variation into an assortment of poses or, to borrow from Clement Crisp’s description of a very slow paced adagio, a “game of statues.” But even with the dancer’s body in constant flow during a variation, one can still try and identify the key positions adopted. This is actually a fun exercise (at least for us! ), as we demonstrate below. We have taken two video fragments, both featuring Royal Ballet dancers: one from the Lilac Fairy variation (The Sleeping Beauty, Prologue) as danced by the joyous Marianela Nuñez, and another from Giselle (Act II), danced by the ethereal Alina Cojocaru†. We have pasted them together and tagged the positions in parts where we think they can be clearly spotted, so lookout for six of those eight positions previously described. Note that while the diagrams in our post had dancers executing the positions from the leg tendu a terre (“stretched” on the ground), Marianela and Alina are getting into their positions with the leg en l’air (lifted working leg). † Copyright from the videos belongs to its respective owners. Standing at an oblique angle to the audience (facing a corner), the leg nearer to the audience is the working leg and is extended in fourth position, pointing on tendú (=stretched) to the front. The arms are placed in (open) fourth position, such that the lower arm is on the same side as the extended leg. Facing the audience, the working leg is extended to fourth position, pointing on tendú to the front, with the arms in second position (open) and the head facing the audience. Standing at an oblique angle to the audience (facing a corner), such as that part of the body is hidden. The leg further from the audience becomes the working leg and is extended in fourth position, pointing on tendú to the front. The arms are placed in (open) fourth position such that the lower arm is on the same side as the extended leg. Facing the audience, the working leg is extended to second position, pointing on tendú to the side, with the arms in second position (open) and the head facing the audience. It is also referred as à la seconde en face. Standing at an oblique angle to the audience (facing a corner). The leg further from the audience becomes the working leg and is extended in fourth position, pointing on tendú to the back. The arms are placed in (open) fourth position such that the lower arm is on the same side as the extended leg. Facing any corner, the leg nearer to the audience becomes the working leg and is extended in second position, pointing on tendú to the side. The arms are in (open) fourth position so the highest arm is on the same side as the extended leg. The head is raised slighlty and turned toward the raised arm, so the eyes look into the hand. Standing at an oblique angle to the audience, the dancer stands in arabesque facing one of the corners (the working leg is the one closest to the audience and is extended to the back in fourth position). The arm closest to the audience is extended forward, and the head is inclined and turned towards the audience. Facing the audience, the working leg is extended to fourth position, pointing on tendú to the back, with the arms in second position (open) and the head facing the audience. Further Information: Technical Manual and Dictionary of Classical Ballet by Gail Grant. BN Publishing. ISBN 1607960311. So this is the first entry of Bag of Steps. You see, we think that one doesn’t need to have been at ballet class to enjoy ballet. However, it is always nice to be able to recognise some steps and to compare how different dancers perform them on stage to give a different meaning to a story. Given that we’ve been enjoying the Giselle run at the Royal Opera House, we thought it was a good idea to start with a step featured in the first act (in Giselle’s first variation), the Ballotté.